Dietmar Kraemer, born in 1957, noticed his own sensitivity at the age of 15. His touch with nature and the desire to help others induced him to finish his studies of Physics at the University of Wuerzburg, Germany after intermediate diploma and to begin an alternative health education. His acquired knowledge led to a systematic research within the scope of natural medicine. In 1987 he discovered the Bach Flower Skin Zones, emotional reflex zones like the zones on the feet, which make the therapy with Flower Essences much more effective and enable direct treatment of physical afflictions. His book New Bach Flower Body Maps was a big success and was translated into several languages. Meanwhile, he has presented his work in more than 400 workshops, lectures at alternative health congresses and on TV. Research on aromatic oils, healing crystals, healing colours and sounds, Acupuncture meridians and chakras followed and was published in several books. Since 1983 he has been working as a naturopath in his own medical practice. From 1984 - 1989 he taught at the natural medical schools in Wuerzburg and Frankfurt, Germany. In 1997 he founded the "International Center for New Therapies", which operates in eleven countries and in nine languages, teaching the results of his research. In 1998 he followed an invitation to Brazil in order to learn spiritual healing, which has become his focus since then. Together with his colleague Hagen Heimann he started an intense research on this topic, and several common books followed. At the age of 17, Dietmar Kraemer started with meditation which he still practices every morning and evening. In 1981 he travelled to India, following an inner urge and found his spiritual master who had called him. During his stay in the Ashram his master assigned him to teach. In 1998 Kraemer's Kundalini awoke, threatening his life. Thus, he went back to Brazil where his healer teachers could avert the endangerment and taught him how to treat Kundalini crises. In the meantime, he travelled to India many times to visit his master's Ashram and to pilgrimage to several holy places such as Kumaon Kailash, Ramtek, Rishikesh and Haridwar. 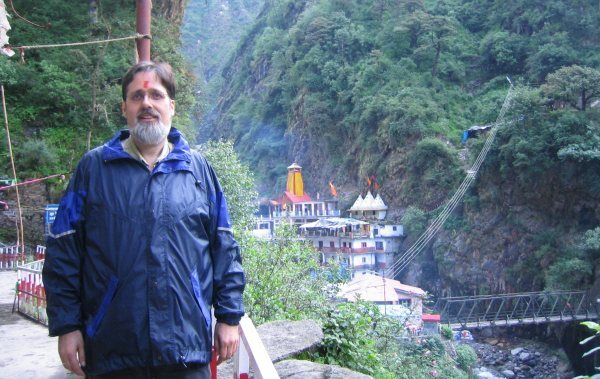 In 2009 he completed the Chota Char Dham Yatra (Yamunotri, Gangotri, Kedarnath, Badrinath). In 2015/2016 he travelled to Central India and South India to see many holy places like Somnath, Ujjain, Omkareshwar, Mount Arunachala and Rameswaram. In 2018 he returned to India to visit other holy places like Vaidhyanath, Varanasi, Grishneshwar, Trimbakeshwar and Bhimashankar.